Fruit salad made by Samantha. 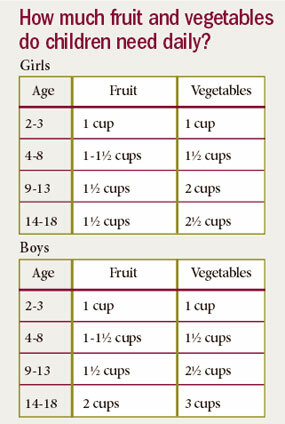 No doubt about it, it’s challenging to get kids to eat enough fruits and veggies. But, in order to keep our kids healthy and strong, we must provide them a variety of healthy foods, especially fruits and veggies. They contain a unique blend of vitamins, minerals, antioxidants, fiber and more that are CRUCIAL to fighting off illness (fewer doctors visits), disease, and cancer (peace out free radicals). These nutrients help maintain healthy organs, aid in tissue repair (healing scrapes and cuts), and promote healthy digestion (hooray poop). And while we all know how difficult it can be to coerce a child into trying something new, if you keep these 10 tricks (I mean, tips) handy, in time, you should notice a less resistant and a more adventurous eater. 1. If at first you don’t succeed, try try again. My son, Jack, is pretty picky. I put broccoli on his plate at least 10 times before he actually ate it. And now, he loves it and asks for seconds! At dinnertime, I always put at least a taste of everything on both kids’ plates, even if there’s a strong chance one of them will dislike SOMETHING. All I ask is that they try a bite and if they don’t like it, I don’t force it. BUT, there is no doubt they will be trying it again the next time I make it. 2. Try them different ways. If your kid isn’t a fan of cooked veggies, try them raw. If they won’t eat them steamed, try them roasted. Cut them into smaller pieces or puree them and add them to spaghetti sauce or soup. Tune into WHY they don’t like it. Is it the texture or flavor? I know multiple kids who won’t eat anything mushy like mashed potatoes or cooked carrots but will eat them if they are crunchy or raw. Knowing what makes them tick is half the battle. 3. Smoothies. If you can’t get your kid to eat whole fruits and veggies, try them in a smoothie. Throw fruit (and veggies if you can get away with it) into a blender with water, milk or a little juice. Make it more substantial by adding nut butter, whole nuts or seeds, or plain yogurt. And if you are feeling really generous, toss a few dark chocolate chips or cocoa powder in for a boost of antioxidants and kid-friendly flavor. Check out my kid-friendly smoothie recipes for ideas. 4. Limit “empty calorie” (foods with little nutrition) snacks. I get it. Kids eat a lot. It’s not realistic to expect them to snack on just fruits and veggies. Crackers and other refined snacks are not great but they are OK, in moderation. Just try to find the healthiest version your kid will eat (i.e., those with whole grains, protein, low in sugar). Try offering a fruit or veggie alongside or allow them to have those snacks only after they’ve eaten a piece of fruit or veggie. 5. Let them help. Kids are more likely to try new things if they are involved in the cooking process. Teach them that tasting is part of the fun and let them be your tester. Teach them how to safely use a knife and let them make fruit salad. Give them a peeler and let them peel carrots or potatoes. 6. Offer them any chance you get. Offer them healthy snacks before the less healthy ones. If my kids are hungry enough, they will eat it. In my house, this is most successful right before dinner. 7. Be creative and branch out. Try spiralizing veggies, using a cookie cutter to make fun shapes or make your own masterpiece on their plate. For a little help, check out these plates. Or these. Or these. And sometimes, you just need to find something new and different. For example, skip the apples and grapes and offer mango or kiwi. 8. Dress them up…or down. Veggies tend to be harder to swallow (pun intended) than fruits. Try melting cheese on top or put dip on the side. On the flip side, if you are making veggies with a kid-questionable sauce or marinade, set some aside before dressing them up. Or, if you are making a salad or soup, for example, pick out the veggies your kid likes and serve those to them separately. 9. Don’t call them out. Just put it on their plates and see what happens. For a long time, my kids didn’t realize that fruit and veggies were the “healthy” foods. It was just part of their meal and they were expected to try them just like anything else on their plate. This may not work as well with older kids who know the difference but for young kids, it’s worth a shot. 10. Make it fun. When my son was little, my husband used to tell him to eat a bite for Darth Vader or that all good ninjas eat broccoli. Remind them they need healthy foods to be as big and strong as the Incredible Hulk or Wonder Woman. This worked often when Jack was in his really picky phase. So how much is enough? Here is a handy chart I’ve borrowed from the USDA. Good luck! And may the force be with you. When I was a Montessori Teacher, we had a garden and did cooking in my classroom. If kids help grow it and cook it they are much more likely to eat it. Imagine one parent’s surprise when her child asked if he could bring one of their “way too big” zucchinis to school so we would make more zucchini bread. Grating it was half the fun. I grew up in a household where it was just a given that when you got home from school, the only snack choices that were made available were fresh fruit and cut up vegetables. Danielle can attest to the fact that to this day, all my siblings are the first to provide and ravage a vegetable relish tray on holidays (of course olives must be included).